Aquatic Mammals is the peer-reviewed journal of the European Association for Aquatic Mammals (EAAM). Manuscripts on aspects of the care, conservation, behavior, medicine and science of aquatic mammals are published four times annually. 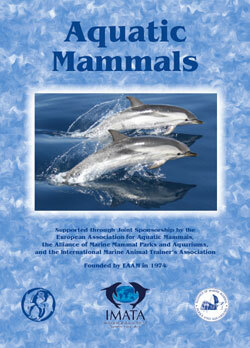 Aquatic Mammals is the oldest peer-reviewed journal publishing papers on marine mammal science. The journal is available as a printed copy, CD, or online directly thourgh our website and through ProQuest. Aquatic Mammals is pleased to have the support of the Alliance of Marine Mammal Parks and Aquariums and the International Marine Animal Trainers' Association (IMATA).